The Georgia Bass Nation Top Six was at Hartwell weekend before last. I had been looking forward to fishing it for months but my boat died at Martin so I didn’t get to go. But the Flint River Club did send a team. I got an email after the first day of the tournament showing Brandon Stooksbury with the Flint River Club in second place, but have not been able to find out the final results. At the same time the adults were fishing the Top Six the Bass Nation High School State Championship took place on Hartwell. Last year at Eufaula Cody Stahl and Tate Von Egmond won. They attend Cross Point Christian Academy in Hollonville and both live here near Griffin. Cody and Tate won again this year, weighing in over 21 pounds of bass in two days and becoming the first team to win two years in a row. And to make things harder, Cody had an injured hand during the tournament, making it harder to fish effectively. Cody said they caught their fish on spinnerbaits and jigs, and their bigger fish came on the jig and pig from blowdowns. Cody likes a Fishog 1/2oz black/blue ‪#‎Jigsaw jig tied on an ALX rods ‪#‎Promise7 flipping rod to pull them out of the heaviest blow downs! After the first day of the BFL Regional at Neely Henry Lake Jordan McDonald was leading on the co-angler side with five bass weighing just over 12 pounds. Jordan qualified for this regional tournament through the Bulldog BFL trail here in Georgia. Jordan fishes with me in both the Flint River Bass Club and Spalding County Sportsman Club. He joined ten years ago when he was 16 years old and has come a long way in that time. He fishes both the BFL and Weekend Series here in Georgia. He is one of the Young Fishermen doing well in tournaments. Catching fish as a co-angler can be tough but Jordan does it well. The co-angler stays in the back of the boat all day and does not have any control over where they go to fish. And the boater can make it almost impossible for the co-angler to fish by the way he positions the boat. Unfortunately, Jordan had a bad second day in this tournament and caught only one bass. In the American Bass Anglers Weekend Series he won the point standings for co-angler this year in Georgia. He is starting to get some sponsors, like Douglas Outdoors Rods, one he is especially proud of since he loves their rods for fishing. Laura Ann Foshee was the only female on the BASS High School All American team. From Alabama, she is a good fisherman and I did an article with her on Seminole this past summer. 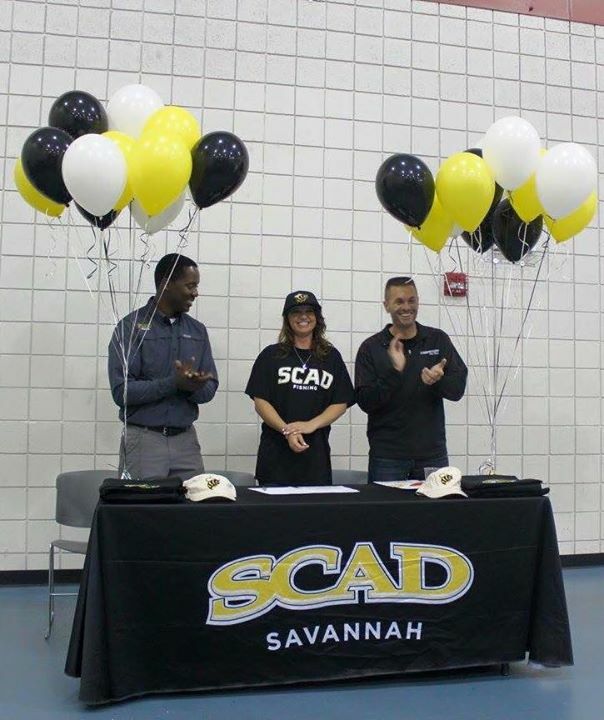 Monday she had a signing ceremony when she get her fishing scholarship to Savannah College of Art and Design. That college is forming a Women’s Varsity Fishing Team to compete at the college level. They already have a Men’s Varsity Fishing team. Laura Ann is the first female to be awarded a fishing scholarship there. Among others, Randy Howell attended the event. Its great to see young local fishermen doing so well in tournaments, and I hope someday to see them fishing and winning the Classic and coming back to Griffin to speak. This entry was posted in Bass Fishing on October 30, 2015 by ronniegarrison. Cool days and even colder nights have water temperatures tumbling; bug hatches are coming to a halt. The once warm summer rains are turning bitter, too – crawlers and the like burrowing deep rather than getting washed into the drink. Young-of-the-year fishes that have avoided being eaten since birth have learned to be on the lookout for predators better than ever. 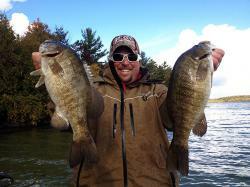 Captain Chris Noffsinger sporting smallmouth bling, which were caught from super-shallow water during the fall season. To say the food sources of smallmouth bass dwindle as autumn arrives is an understatement. As fall starts showing its face, a smallie’s diet turns to the only forage left: baitfish and crayfish; with the latter becoming scarcer as the season wanes. It’s this forage-vanishing-act that has bronze-finned prowlers on the move. It’s also what makes them easier to catch this time of year. But smallmouths aren’t always roaming where you might think. Classic deep water haunts, weedbeds, reefs and sunken timber aren’t providing sustenance. So where might one find smallies when the leaves start turning? In depths registering only in the single digits; that’s 2 to 5 feet, even in ultra-clear water. Enter Captain Chris Noffsinger, bass aficionado and fulltime guide on the waterways surrounding Traverse City, Michigan. Smallmouths have populated the Great Lakes and natural inland lakes here since the last glacier receded nearly 10,000 years ago. The fishery is loaded with trophy-size bass; many which are caught in places the average angler wouldn’t even consider casting. “Sometimes my clients get a dumbfounded look on their faces when I tell them where to cast,” said Noffsinger. “But I don’t blame them, because, after all, we’re on giant sand flats with not a stitch of cover to be found except maybe some gravel or sand grass. With trolling motor deployed, Noffsinger covers as much water as possible. Overall, the trick is using lures that imitate minnows, but at the same time, won’t dive into the dirt – spinnerbaits being a prime example. The captain’s favorite is Red Dirt Bait Company’s 1/2- and 3/4-ouncers, with painted willow-leaf blades, because they can be cast far, fished fast and his clients can cover a lot of water. Spoons can be worked slowly, all the while staying in the strike zone without dredging bottom. Spoons, however, are rarely thought of as a smallmouth bait, yet do catch fish, and deserve more respect. Lures that don’t dive into the dirt, like spinnerbaits and the Fin-Wing (pictured) imitate the minnows smallmouth chase in autumn. The #-3 Fin-Wing can be retrieved at a steady pace in super-shallow water without snagging up. It’s stamped from metal, but its wide, swimming wobble is nothing like that of an ordinary spoon. Because of the Fin-Wing’s unique shape, light reflects off it at multiple angles and the lure gets noticed like the flashing blades of a spinnerbait. Increase the speed of your retrieve and the Fin-Wing turns toward the sun and creates a wake, even rides the surface with a walk-the-dog action; perfect for first light in the shallows. Noffsinger and his guests also throw soft-bodied lures like un-weighted flukes, aka soft jerkbaits. When retrieved with a twitch, these lures dart side to side wildly like an injured minnow. If the smallies aren’t responding to the erratic motion of flukes, large grubs on a light-weight jig head, fished with a steady retrieve will often do the trick. BFishN’s 5-inch K Grub on a H20 Precision Jig is a great option as the grub’s mega tail has more than enough whirl to emit vibrations. Making long casts is a must in such clear, shallow water. Seven foot plus rods will get your bait farther from the boat. But fishin’ sticks must also have enough backbone to make a solid hookset, which can be challenging with so much line out. Seventeen-pound-test fluorocarbon coursing through a St. Croix 7-foot Mojo Bass Spinnerbait casting rod, for example, will whip a spinnerbait a country mile and still stick a hook. The low stretch of fluoro helps oversized hooks penetrate a bass’ boney jaw, making the line perfect for spoons and spinnerbaits. Meanwhile, a 7-foot medium-power fast-action St. Croix Avid X, for instance, has the ability to properly launch a lighter soft plastic on 8-pound-test fluoro. If you’re looking to catch big smallies this fall, explore the shallow wastelands. Position your boat on a shallow flat, cast shoreward and cover water with baitfish imitating lures. Make long casts and employ a rod and line that support solid hooksets at long distances. You know all those featureless shallow flats you buzzed by all summer long? Time to put on the brakes and commence casting. This entry was posted in Bass Fishing, How To Fish on October 29, 2015 by ronniegarrison. Randy Howell won the Bass Masters Classic in 2014 on Lake Guntersville. This is the top tournament of the bass fishing world, and I compare it to football by saying the Superbowl is the Bassmasters Classic of football. Winners of the Classic are in great demand for speaking engagements and doing other publicity for their sponsors. This last for years but the year after they win the Classic is the busiest by far. Last year I contacted Randy about doing a magazine article. When I talked with him at the Classic media day a few days before he won, he said he would like to do one of my Map of the Month articles in Alabama Outdoor News and gave me his favorite lakes in Alabama near where he lives. When I contacted him in June he said he was sorry but every day but three for the rest of 2014 were scheduled for him to do something. Can you imagine having commitments every day for six months except for three? That is the price a successful fisherman pays, and they are all willing to pay it. Randy will be the speaker at the Devotie Baptist Church’s Annual Sportsman Event at 7:30 this Thursday, October 29. The public is invited to attend to hear Randy’s presentation. Devotie Baptist Church is on Experiment Street and they are expecting a very good turnout. It should be a great experience. This entry was posted in Bass Fishing, Bassmasters Classic, Tournament Fishing on October 28, 2015 by ronniegarrison. For years, George Trice watched as blue catfish numbers on the James River grew, while his blue crab catches dwindled. The James is filled with huge numbers of catfish that are “eating the whole river up” including the crabs, the Poquoson-based waterman said. So Trice, as he puts it, is working to get even. He does that by sticking two electrodes into the river and sending a low-frequency electric jolt through the water. All around, stunned blue catfish pop to the surface, and Trice and his crew dip them out of the water in almost unfathomable numbers. His catches can routinely hit 6,000 pounds a day. “The only limiting factor is what the truck will carry away,” Trice said. Last year, he caught 170,000 pounds of blue catfish, and he expected to more than double that to 400,000 pounds by the time he pulls his electrodes out of the water in early October. Electrofishing isn’t a normal method of commercial harvest, but Trice has a research permit from the Virginia Marine Resources Commission and is working with scientists from the Virginia Commonwealth University and the Virginia Institute of Marine Science to determine the potential of the technique to help control the rampant population of nonnative blue catfish. A grant from Virginia Sea Grant helped him purchase the equipment. But the unconventional fishing technique has drawn the ire of some recreational anglers on the river, who prize large blue catfish. And while the VMRC has allowed him use the gear in tidal waters, where it licenses commercial fishing, another state agency is worried about the practice. Biologists with the Department of Game and Inland Fisheries say electrofishing may have unforeseen consequences for other species in the river. 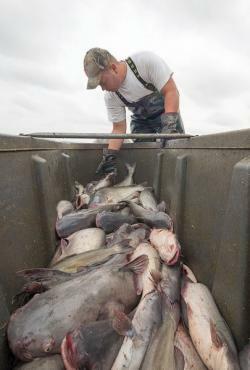 While the VMRC licenses the gear, the DGIF sets catch limits for blue catfish. Right now, though, the only limit is one blue catfish larger than 32 pounds a day. But DGIF staff, worried about potential consequences, are preparing a recommendation that opposes the use of electrofishing for blue catfish harvests, said Bob Greenlee, a DGIF fisheries biologist who has been working with blue catfish for years. Biologists have long used high-frequency electrofishing, which essentially stuns everything in the water — and can be dangerous to people — to conduct fish surveys in rivers and streams. But catfish can be stunned with less-intense, low-frequency electrofishing, which provides a mild jolt barely felt by humans. Biologists have used the technique for years to work with catfish. When Trice shocks a section of the river, all that pops up in the surrounding water are catfish — primarily blue catfish but also flathead and white catfish. Two-man crews in two chase boats quickly go to work with dip nets to scoop fish out of the water. After about two minutes, the fish recover and begin to swim away. Because only catfish come to the surface, the crews can selectively dip only blue catfish out of the water. But there are limitations to the equipment. It can only be used in low-salinity water. Much of the lower James River — and the blue catfish living there — are off-limits to Trice. Also, water temperatures have to at least be in the low 70s for it to work, so his fishing season is limited to about four months. Greenlee said those limitations raise questions about whether electrofishing is actually increasing the overall harvest, or simply giving Trice a technological edge over other fishermen who work the same areas day after day. Other commercial fishermen have complained that electrofishing is reducing their blue catfish harvest, Greenlee said. But multiple fisherman may not be able to use the electrofishing gear in the same river. Trice said the fish begin to get tolerant if he shocks the same area more than once, so he has to keep moving from place to place, typically revisiting an area only after a couple of weeks. Sometimes he takes a break from the James altogether and uses the gear on the Pamunkey River. Garman said electrofishing might be especially useful in smaller rivers with ecologically important species that biologists want to protect. It would be too expensive to pay biologists to try to control blue catfish populations in those places, he said, but it might make sense to let commercial fishermen do the job — and make some money. “It’s not going to solve all of the problems out there overnight, but it could be part of the solution to a couple of problems,” Garman said. Greenlee, though, said it’s not clear that electrofishing itself isn’t causing a problem, or that only catfish are affected. During thier own work, he said, DGIF biologists have observed other species affected by low frequence electrofishing, including longnose gar, common carp and gizzard shad. While only catfish rise to the surface, he said other species, such as Atlantic sturgeon, sink to the bottom and therefore go unseen. “That is a question that is of concern, particularly with Atlantic sturgeon,” Greenlee said. Atlantic sturgeon are an endangered species. Even if it did not harm a sturgeon directly, he said, it could have other impacts, such as causing them to abandon a spawning run. Garman said he is skeptical that the electrofishing is having a signficant impact on other species, but said research should continue. “I hope the agencies can wait long enough so they can make decision based on good fisheries science,” he said. Greenlee said his department does support a commercial blue catfish harvest — just not one that uses electrofishing. In fact, he said ramped-up fishing could actually be beneficial. The James River only a few years ago was a hot spot for trophy blue catfish, some of which reached 100 pounds. But the river has become so overwhelmed with catfish that it has exceeded it carrying capacity and large fish have become scarce. Instead of producing large trophy fish, it is increasingly filled with slow-growing small catfish, all competing for a limited food supply, rather than the large trophy size fish prized by many recreational anglers. “If we can harvest enough small fish and get them out of there, there is that potential for the trophy fishery to sustain itself at a higher level,” Greenlee said. Karl Blankenship is editor of the Bay Journal and Executive Director of Chesapeake Media Service. He has served as editor of the Bay Journal since its inception in 1991. Read more stories like this at www.bayjournal.com. This entry was posted in catfish, Conservation on October 27, 2015 by ronniegarrison. If you consider yourself a conservative do you have any to add? Any liberal want to add some going the other way? You think it is great that Two muslim truck drivers who refused to haul alcohol are awarded $240,000 in religious discrimination suit – But you also think it is great that two bakers are fined for refusing to bake a cake because of their religion. This entry was posted in Fishing Ramblings - My Fishing Blog on October 26, 2015 by ronniegarrison. What Is the Real Alabama Red Snapper Tally? EDITOR’s NOTE: Today’s feature, written by Alabama Department of Conservation and Natural Resources’ David Rainer, is yet another example of the continuing conflict between the five states that comprise the shores of the Gulf of Mexico and federal authorities when it comes to managing the Gulf’s fisheries. As you’ll read, the results don’t seem to surprise anyone- but the fight continues. As many Alabama offshore anglers will attest, the results from the red snapper catch data is the same old song, second verse. When the mandatory Red Snapper Reporting System was implemented for the 2014 season, the Alabama Marine Resources Division had a pretty good idea that the catch numbers compiled by the NOAA Fisheries was significantly inflated. The catch data for the 9-day 2014 season reported through Alabama’s “Snapper Check” was 455,522 pounds, while the feds estimated the catch at a whopping 1,227,469 pounds. 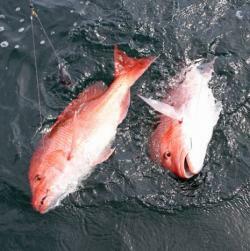 The discrepancy between the Alabama red snapper catch data and the federal catch data was recently confirmed with the 2015 numbers. Keep in mind the 2015 season was different because of sector separation. The private recreational anglers had a 10-day season. The charter boats with a federal reef fish permit were allowed to fish 44 days. Still, the discrepancy was significant. The federal catch estimate was 2,355,481 pounds. Marine Resources estimated the catch off Alabama at 56 percent less than the federal estimate at 1,045,042. The average-size red snapper landed was more than 8 pounds. “We continued the Red Snapper Reporting Program for a second year to compare it to the federal MRIP (Marine Recreational Information Program),” said Chris Blankenship, Director of the Alabama Marine Resources Division. “Last year, the results showed that Alabama caught about two-and-a-half times less red snapper than the federal government estimated we caught. Anglers who pursue red snapper off the Alabama Gulf Coast have had no problem at all landing nice red snapper during the short seasons (above). Ongoing research on the red snapper population off of Alabama indicates a healthy, vibrant stock (Below). Photos by David Rainer, with permission. Blankenship said even though the parameters changed because of the sector separation, Marine Resources was interested to see if that discrepancy between Alabama numbers and federal numbers would be similar for 2015. “This year, the federal program estimated there was more than twice the number of red snapper landed than what the Alabama program estimated,” he said. The reason Blankenship is confident in the Alabama numbers is because of the collection of data through the mandatory Red Snapper Reporting Program and the deployment of Marine Resources personnel to conduct checks at the public boat ramps and marinas, as well as on-the-water checks by enforcement personnel. “We end up with a correction factor for the ones that were not reported,” he said. “We use that to come up with the final numbers. It’s a much less complicated system than what the federal government uses, and we feel ours is much more accurate. Blankenship also said the MRIP system is still using a telephone survey of coastal households and extrapolating the data. “It’s obvious to us when we look at the results from that telephone survey that they are overestimating the amount of effort, the number of fishing trips for the state of Alabama,” Blankenship said. “We are attempting to work with the MRIP team to see what’s causing the difference in data. Blankenship said one example of MRIP data that cannot be accurate came from Mississippi. 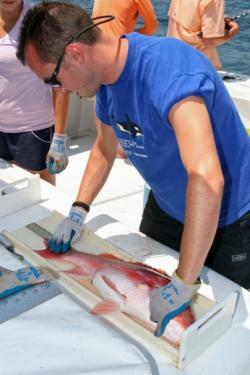 “When you look at the landings on the NOAA MRIP website for the private recreational season in Mississippi and the federal estimate of their catch, for the 10-day red snapper season in June, the federal MRIP system estimated there was not a single red snapper landed in the state of Mississippi,” Blankenship said. “So in Alabama, the feds estimated we caught more than 2 million pounds of red snapper, and in Mississippi, they estimated they caught zero red snapper during the same time period. This just shows the MRIP system obviously has some flaws. The current federal quota for the recreational sector has a 20-percent buffer built in to account for overages. Blankenship said the best way to get rid of that ridiculously large buffer is to have more accurate catch data. The Gulf of Mexico Fishery Management Council is considering Amendment 39 that would give the five Gulf States regional management of the red snapper fishery. A public hearing on the amendment was held in Mobile Tuesday night. The full Gulf Council will consider Amendment 39 at its next meeting, which is scheduled for January 25-29, 2016, at Perdido Beach Resort in Orange Beach, Ala.
Blankenship said Marine Resources is in the process of doing a stock assessment off the coast of Alabama and will hopefully have the results by the end of the year. The early numbers look good. “The snapper stock seems to be very healthy even after the season,” he said. “Whether we caught a million pounds as Alabama estimates or 2.3 million pounds as the federal government estimates, we’ve been out there doing research since the season ended. This entry was posted in Conservation, Saltwater Fishing on October 25, 2015 by ronniegarrison. Where Can I Fish from the Bank Near Atlanta? Do you find it funny that folks fishing from a boat usually try to cast as close to the bank as possible, while those fishing from the bank usually try to cast as far out in the water as they can? Fishing from a boat definitely gives you some advantages, but so does bank fishing. Fortunately there are a lot of places where you can fish from the bank near Atlanta. You can drive to them in an hour or so and enjoy good catches. And you have a lot of options for catching bass, from lakes and ponds to rivers and creeks. Fishing from the bank usually makes you fish slower. There is no pressure to run to another spot to try to catch a fish and leave the ones you could catch if you slowed down and fished carefully. Patience often pays off in better bass catches. You can concentrate on covering a piece of cover carefully and get the bass to bite. You can fish from the bank much more efficiently if you are willing to wade in shallow water. At times you will need to go around obstacles on the bank by getting into the edge of the water and other times easing out to a couple of feet of water will allow you to reach cover a little too far away from the bank, or to get a better angle on shoreline cover. And fishing streams often requires wading. Invest in a pair of rubber boots if you don’t like getting your feet wet. You can get a pair that come up almost to your knees for less than $20 and they will really pay off. If you wade in tennis shoes, carry a dry pair of sox and shoes for the ride home. Keep your tackle simple. A couple of rods and reels, one for casting light finesse type baits and one for casting heavier baits is all you need. On the light outfit spool eight or ten pound line. For heavier baits or fishing thick cover go to fourteen pound test on the other outfit. A small plastic tackle box that fits in your pocket makes fishing easier. Have some spare hooks and sinkers, a top water plug, a crankbait, a spinnerbait, a few jigs and some plastics. Be able to rig the plastics either weighless on the light outfit or with a one-sixteenths ounce sinker. On the heavier out a three sixteenths to one quarter ounce bullet weight for longer casts and deeper water will work. The following spots give you several options for catching bass from the shore, so choose one and learn all the cover around it, or try them all. Lanier is a big lake and you might think you can’t cover it without a boat, but go to one of the parks and you can catch fish from the bank. A good one is Buford Dam Park on the south side of the lake right beside the dam. Both spotted and largemouth bass bed in the pockets in the park on hard bottoms. Sand and gravel are the best bottoms to find bedding fish. Largemouth will bed in more shallow water and further back in the coves than the spots. You can often see the beds or the bass on them. Cast a worm or lizard into the bed and watch your line for a bite. If you can’t see any beds, drag a Carolina rigged lizard on the sand and gravel bottoms. Move it very slowly to make the fish bite. Rocks on the dam and in the park are favorite feeding areas. You can cast to the riprap on the dam but be careful walking on the rocks. There is also some riprap in the park to fish. Try a topwater bait, spinnerbait and crankbait over the rocks. The main lake point past the parking lot is good later in the spring and in the summer as the bass move out to deeper water. A jig and pig or worm works well on the point. Also try fishing from the dock in the park, but bass often hold under it. Walk to the edge of the water near the dock and cast a worm or jig under it in the shade. For a good variety of options in one area, drive out I-20 East past Covington to Highway 11, turn south and follow the signs to Charlie Elliott Wildlife Center/Marben PFA. There are 27 different ponds you can fish here but you will need a special license to fish them. 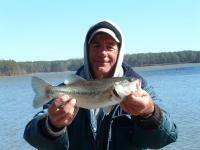 One of the best ponds for largemouth bass is 49 acre Lake Margery. From the shore you can fish the PVC fish attractors, standing timber and brush, riprap and there is a fishing pier, too. The lake is managed to make shoreline fishing easier. Early in the morning cast a topwater plug over brush and riprap and try the standing timber, too. As the sun gets up work a jig and pig or Texas rigged worm through the brush and timber. In the middle of the day work a crankbait or worm through the standing timber. Look for bedding bass on this lake, too. And if you can fish the boat ramp without getting into a no fishing area around it, cast a worm to the end of it. Also try the dock on Lake Margery. If you don’t have good luck on this lake you do have other options to try. Lake Bennett at 69 acres and Lake Fox with 95 acres both offer the same kind of cover and good fishing as Lake Margery. Head out I-20 West past I-285 to Exit 44 at Thornton Road and follow the signs. Sweetwater Creek State Park offers a lake to fish, where you can rent a boat if you want to go out on the lake, and a stream that empties into the Chattahoochee River not far from the park. Both the lake and stream offer good fishing. On the lake don’t hesitate to fish around the heavily used areas where folks like to feed the ducks, if there are not any no-fishing signs. The food for the ducks attracts bream that attract bass. A weighless worm sinking slowly to the bottom is a good pattern to try. Also try both bridges. There is riprap to fish on both. Try topwater early then switch to a crankbait or spinnerbait. Both the big bridge and the smaller one where Mount Vernon Road crosses the lake and a smaller pocket have a culvert under the road. Around the culverts try a Texas rigged worm fished near their mouths then cast to deeper water out from the pipe. The culverts mark the channels and bass will often hold on the edge of them so work your worm along the bottom probing for cover. Sweetwater Creek has shoal, spotted and largemouth bass living in it and they are all fun to catch, but shoal bass and spots will give you the best fight. Shoal bass are not common in most waters so they are usually the targets here. There is a trail along the creek but you will want to wade to catch more fish. Be careful on the slippery rocks. Shoal bass hold in the deeper pools and can be caught on Texas rigged worms. Rig them behind a one-eighth ounce sinker and cast where the current enters the pool, working your bait with the current. Try the deepest parts of the pool as well as the tail end where the water leaves it. A small shallow running crawfish colored crankbait is also good. Fish it with the current in the pools. Also try both baits around any rocks breaking the current. Bass often hold behind the rock so cast upstream of it and fish your bait with the current slowly, letting it move at the speed of the current to offer a natural action to the fish. Fish both baits on light tackle. The bass are not big, with a two pounder a nice fish, but they fight extremely well in the current. Many people say the creek is polluted and will not eat the fish from it, which means more to catch. The state does not list any restrictions on eating fish from Sweetwater Creek but catch and release is the way to go there for safety and the fish population. The Flint River is home of the shoal bass and you can catch a lot of fish, and some quality ones too, in the river. The record shoal bass, an eight pound, three ounce monster, was caught in the Flint River in 1977. They are often called “Flint River Smallmouth” because of the way they look and fight. Access to the river is limited but the river itself is public waters. The best way to fish the Flint River is to float it in a canoe or small jon boat but there are some places you can drive to and wade the shoals. Sprewell Bluff State Park is a good place to try. Sprewell Bluff State Park is south west of Thomaston. Take Highway 74 West out of Thomaston, turn left on Old Alabama Road to Sprewell Bluff Road and turn left on it. It dead ends in the park. Wading is definitely the way to go here. You can cast from the bank but the river is wide and some of the best fishing is upstream of the parking area at the park and you will have to wade to get to it. Be extremely careful on the slippery rocks and the deeper spots. The current can be strong. Wading is best when the river is low. When you get to the park turn right on the dirt access road going upstream until it ends. If you park there and follow the edge of the river you will come to a big rock bluff and need to wade to get around it. Then start fishing the shoals. Small baits are best even though you have a good chance of catching a quality shoal bass. Eight or ten pound test line is heavy enough but check your line often since it will get frayed on the rocks. Shoal bass feed heavily on “rock worms,” the local name for hellgrammites, and a four or six inch black worm imitates them, so it is a good bait. Texas rig it on a one sixteenths ounce sinker and fish it slowly with the current. Crawfish are another main target of shoal bass so a small, shallow running crawfish colored crankbait is good. Cast it and the worm upstream and work with the current. Target deeper pools and riffs where the current is broken by rocks. The bass hold downstream of the rocks in the eddies created by them. 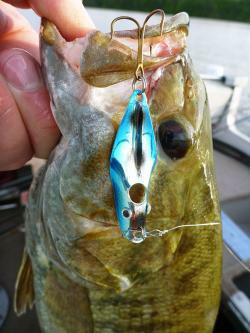 Topwater baits like a small popper can be excellent for shoal bass, too. Try them in slower moving pools and start with a fast retrieve. If that doesn’t work slow down. Early in the morning and late in the day when shade is on the water is best for topwater, but the bass will hit on top all day long. You can wade a good ways upstream of the park parking lot and there are excellent shoals to fish. It is not unusual to catch several bass from one rock in a good run, or from a deeper pool. If you catch fish going upstream but sure to hit that same spot coming back downstream. There is a big deep pool just downstream of the parking lot but past it are more good shoals. The river is split by a big island and both sides of it can be good. If you don’t have a suitable boat for fishing the river but want to try it, Flint River Outdoor Center at the Highway 36 Bridge will rent you a canoe, take you to Sprewell Bluff and put you in. You can fish back down to the Center where your vehicle is parked. If you rent a canoe it allows you to fish the deeper water in pools. You an also tie up at the shoals and wade them. Just watch your time, this is a half day trip and it is easy to lose track of time while fishing. All these spots offer fun fishing from the bank or a boat. Try them all, pick your favorite and you can spend many hours fishing close to the big city. If you like fresh steamed or boiled seafood, plan your trip to the Flint River on a Thursday, Friday or Saturday. Stop at the Fish Peddler on your way back home for some of the best seafood in the area. The Fish Peddler is a fish market as well as a restaurant. Their seafood is trucked in each week from the Gulf Coast, so it is always fresh. It looks like a dump, with ramshackle buildings but don’t let that stop you. It is a local favorite and you will be eating in a rustic setting with a lot of folks. And the prices are very reasonable. Don’t ask for fried seafood, they don’t fry anything. Boiled shrimp and steamed oysters are favorites but they have a variety of Gulf seafood. The Fish Peddler is on the right side of Highway 19 headed north, just past the bridge over Potato Creek. Watch carefully, it is easy to miss. Look for a bunch of cars around a very rustic building and a small sign identifying the restaurant. This entry was posted in Where To Fish on October 23, 2015 by ronniegarrison. Mobile Bay and the Mississippi Sound are bugged, but the listening devices aren’t snooping to hear the inshore anglers’ big-fish tales or locate their favorite fishing holes. The microphones, known as hydrophones, are strategically positioned around the Bay and Sound to listen for the fish themselves – a select group of fish. 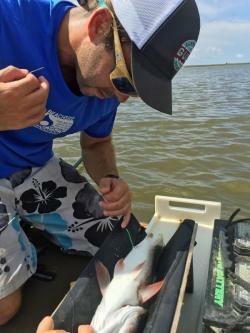 In a study sanctioned by the Alabama Marine Resources Division (MRD), several inshore fish are being fitted with sonic devices that will be picked up by the hydrophones to get a better idea of where and how much they travel during the year. Chris Blankenship, MRD Director, said the project is in collaboration with the Mississippi Department of Marine Resources, which has hydrophone stations on the west side of Mississippi Sound. “This should give us a better picture of the movement of those inshore fish,” Blankenship said. “It started as a tarpon project because that’s Alabama’s state saltwater fish, but we had very little information about the movement of tarpon in our area. Once the hydrophones were out, we had the opportunity to include other species, so we added red drum (redfish) and spotted seatrout (speckled trout) to learn about those fish movements at the same time. Dr. Sean Powers and the University of South Alabama Marine Sciences Department are conducting the study, which has been dubbed CAAMP, the Coastal Alabama Acoustic Monitoring Program. 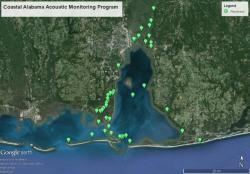 There is an array of 40 listening stations with hydrophones strategically placed around Mobile Bay and Mississippi Sound. “The hydrophones were placed around the bay to cover the entry and exit points of fish, and in this instance, we’re talking about a red drum or speckled trout,” Powers said. “We have all the rivers covered in the (Mobile/Tensaw) Delta. We have a string of them along the Causeway, at Fowl River and Dog River. We also have them in Mississippi Sound. The hydrophones are designed to pick up acoustic signals with unique codes that identify individual fish. The acoustic tag sends a series of sound pulses in a few seconds. The hydrophone interprets that signal and identifies the fish. If it was a fish from Alabama, the identification of the fish gives researchers data on where the fish was tagged and where it was located when the signal was picked up at different times. If the hydrophone identifies an unknown code, the other states involved in the program are notified. Each fish in the study is caught by researchers or other anglers and the small tag is attached. The Mobile/Tensaw Delta and its role in the movement of inshore species is of particular interest to the researchers. Typically, the inshore species follow the migration of shrimp and other food sources into the rivers and creeks in the fall, depending somewhat on water salinity and flow. The acoustic study is being done in stages, according to species. The first year is red drum. Powers said about 100 redfish have already been tagged. “That was the fun part,” he said. “We went out and tagged them all around the Bay, some in the Delta and some off Fairhope, some off Bon Secour and some off Dauphin Island. That rate of survival, or escapement, plays a crucial role in the management of red drum, Powers said. Current management models are based on 30-percent escapement. The red drum study will be expanded next year with different parameters. Half the fish tagged will be wild fish, and half will be fished raised at the Marine Resources Division’s Claude Peteet Mariculture Center in Gulf Shores. “We’re really interested to see if there is a difference in movement in wild red drum versus hatchery-raised red drum,” Blankenship said. Speckled trout will be added to the study in year three; however, several speckled trout that were part of the live weigh-in for the Alabama Deep Sea Fishing Rodeo were tagged and released as well. Powers said the species for years four and five are undecided but could include flounder and/or sheepshead. Before CAAMP came into existence, Powers said a tarpon study had been underway for a couple of years. Powers said the information from the hydrophones is downloaded about every six months. PHOTOS: (Crystal Hightower, tarpon by Andrea Kroetz) As part of the CAAMP array, hydrophones are stationed in Alabama coastal waters to pick up the signals from the tagged fish to study seasonal movements and escapement rates. A small acoustic device is inserted by Reid Nelson into the body cavity of the red drum in the study. Larger tags are attached near the dorsal fin on tarpon. This entry was posted in Conservation, Saltwater Fishing on October 22, 2015 by ronniegarrison. I look forward to the three club tournament at Lake Martin in October all year long. The weather is usually beautiful, the lake very pretty and the fish bite. For the past 12 months I have been anticipating the trip this year. But this year I had bad luck fishing Lake Martin. Several were and I caught a couple of fish on a drop shot worm. Everything was great, it was warm but not too hot and, as usual, the clear lake surrounded by trees just starting to get a little color were set off by the white sandy and rocky shoreline. Thursday morning I got up before daylight and headed out to check some more places. I was disappointed when I went to a bank where I had caught 17 bass on topwater last year on Thursday and got only one bite. During the day I caught a few fish but nothing to get excited about. Friday morning I started with topwater in a place I fished a lot years ago but did not plan on fishing in the tournament, and caught two nice spots on topwater. Then I decided to make a long run to the other end of the lake to check some places a guide showed me. I landed a 2.5 pound spot and a three pound largemouth on two of them on topwater so was pretty excited. Jordan McDonald joined me Friday night and Saturday morning we took off with great hopes. The first place we stopped was a deep bank where I had lost count after landing 20 bass the first hour of the tournament last year, but I caught only two fish. One was a two pound largemouth that turned out to be my biggest fish of the day. We started fishing “memories,” places I had caught fish in the past, and by noon we both had limits of small fish. In the past I have been able to catch a kicker fish, a bigger fish to help my weight, up the river so we decided to make the ten mile run just after noon. We were running at about 55 mph and within a mile of where I wanted to start fishing when my motor made an odd sound and lost power. After we settled in the water I cranked the motor again and it cranked, but rattled. Something was broke. Jordan called Russell Prevatt since we knew he was fishing fairly close to us and he said he would either tow us in or get Jordan and our fish and take them to the weigh-in. We started fishing back down the river with the trolling motor, knowing our day was ruined. I decided to call BoatsUs, an organization I have been a member of for about 20 years. They offer free on-the-road towing, the reason I was a member since they will get someone to you that can tow your vehicle and boat if you break down on the road. Most tow services won’t tow a boat so you have to leave it by the road, not a good thing. They also offer on-the-water towing on most lakes. I didn’t pay the additional $48 a year to have it covered but with basic membership they cover $50 of it. I called the 800 number on my card and the woman I talked with was great, getting my location and connecting me with their tow service on Martin. The two boat driver told me it would take him about 30 minutes to get to me, he was located at a marina way down the lake. Sure enough, he got to us right at 30 minutes later, tied us to his boat and towed us in at 25 mph on plane! They charge $160 an hour and my bill was $240 total. I had to pay all but $50 of it but it was well worth it to get in that fast and not inconvenience anyone else in the tournament. Jordan and I fished around the marina the last two hours of the tournament and I did catch my second biggest fish of the day, a spot weighing almost two pounds. The next day Jordan fished with Russell and I, being hardheaded, turned down Javin English’s invitation to fish with him. I thought I could catch some fish around the marina but I landed only two small keepers all day, fishing very slowly since all I had was my trolling motor. In the tournament 30 fishermen landed 209 bass weighing about 223 pounds in the 17 hours we fished. There were 37 five-fish limits weighed in and two people didn’t catch a keeper either day. The first day Russell Prevatt won with five weighing 8.29 pounds, Kwong Yu was second with five at 7.89 pounds, Donnie Willis placed third with five weighing 7.82 pounds and William Scott had five for 7.81 pounds for fourth and big fish at 3.68. On Sunday Javin English won with five at 9.50 pounds, Billy Roberts placed second with five at 7.31 pounds and big fish at 3.0 pounds, third was Wesley Gunnels with five at 7.59 and fourth was Bobby Ferris with five weighing 7.14 pounds. I thought I had broken rings or melted bearings in my motor but B and B Marine in Jackson said it was my lower unit. That was good news, a rebuild on a power head is about $6000 and a new lower unit is only $3000. I did price a completely new motor but at $20,000 I think I will have this one repaired! I’m already looking forward to going to Martin next year, I just hope my luck is better. This entry was posted in Bass Fishing, Tournament Fishing on October 21, 2015 by ronniegarrison. Early autumn in the Southwest may be the best time of year for anglers and hunters. Upland bird seasons are in full swing, waterfowl are on their way back south perhaps to intersect with you on a duck marsh somewhere. It’s not too cold to catch trout in the high country while elk bugle beyond the next aspen glade. All of these pursuits have something in common, aside from the obvious. As a hunter and angler and boater you are paying for conservation. Next time you gas up your boat, buy a spool of 10-lb test monofilament fishing line, or a box of bird load for your 12-gauge pump, keep this in mind: a portion of what you pull out of your wallet is invested back into conservation. Here’s how. Two acts of Congress, laws originally enacted in 1937 and 1950, laid the path for a user pay-user benefit system where the end outcome is improved hunting and fishing and boating. While your hunting and fishing licenses help pay for the wonderful work performed by biologists, conservation officers, and support staff in you state game and fish department, a tax on your sporting goods takes your commitment to conservation a step further. Manufacturers and importers of firearms, ammo, archery gear, boats and motors and fuel, and fishing gear pay excise taxes to the federal government. That tax is passed on to you in the price you pay at the cash register. That little bit extra is held in trust by the U.S. 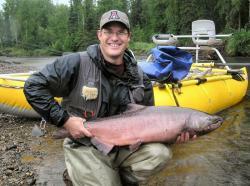 Fish and Wildlife Service’s Wildlife and Sport Fish Restoration Program. That money is reapportioned in grants back to state agencies, but with a catch; the money must be used on projects that benefit fish and wildlife in some measure, boating access or research and education. These recent projects exemplify the benefits accrued to hunters and anglers and boaters in the Southwest. Arizonans are rightfully proud of their world-class Ben Avery Shooting Facility in north Phoenix. More than 120,000 shooters of all ages use it each year. It is home to regional- and national-class shooting competitions. 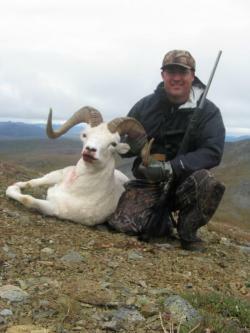 Hunters hone their skills there and young shooters might pull their first trigger on the firing line with trained safety officers nearby. A new boat ramp, parking area and access road brought quality striped bass and white bass fishing within reach of anglers in the Agua Fria arm of Lake Pleasant after a seven-year closure. What is fish habitat is also attractive to nesting bald eagles in spring. To overcome a conflict in protecting the birds, the Arizona Game and Fish Department made the site accessible to anglers willing to travel to the remote area. Prescribed burns and forest thinning in the Guadalupe Mountains by Lincoln National Forest personnel improved habitat for Merriam’s turkey. Along with new water catchments, the area is now expected to hold more wildlife. The New Mexico Department of Game and Fish (NMDGF) trapped 47 wild turkeys near Cimarron, New Mexico, and released them in the Guadalupe Mountains. The delicate and labor-intensive operation returned native New Mexican wildlife back into its former natural range. Anglers and boaters should be pleased to know that Lake Roberts, nestled in the Gila National Forest, now has an improved dam and spillway. The renovated structure is more secure ensuring that fish habitat remains intact, and that anglers continue to enjoy quality trout fishing in the prettiest of places. The fishery is managed by the NMDGF. The Texas Parks and Wildlife Department (TPWD) used Wildlife and Sport Fish Restoration dollars at the Sea Center Texas, at Lake Jackson; CCA Marine Development Center, Corpus Christi; and the Perry R. Bass Marine Fisheries Research Station in Palacios, Texas. Scientists there research and raise red drum, spotted seatrout and southern flounder—sport fish species important to the economy and coastal ecology. The red drum population in Texas bays has rebounded to near-record highs. Red drum are stocked in nine bays along the Texas coast. Anglers can get to those red drum easier, too, thanks to other work completed by TPWD. Fish cleaning stations, boat ramps, lighted parking areas and restrooms built on the Mission River and Copano Bay access points near Gulf waters improved boating. The Oklahoma Department of Wildlife Conservation (ODWC) recently used Wildlife and Sport Fish Restoration dollars at Grand Lake O’ the Cherokees near Tulsa, improving boat ramps, docks, lighting and fish cleaning stations. It will be the site of the hugely popular Bassmaster Classic in 2016. And there’s the Grady County Wildlife Management Area (WMA) near Rush Springs, Oklahoma. This year the ODWC built two ponds for fish and waterfowl. The 1,036-acre woodland and tall-grass prairie WMA already supports deer, turkey and rabbits. Public access was enhanced with a road and fencing. All of these projects, making a real difference on the ground and in the water, were funded by the Wildlife and Sport Fish Restoration Program—that is, funded by you—hunters and anglers and boaters. It’s your wildlife, your public lands. We as Americans are fortunate in that our natural resources are held in trust, for us, by us. I hope that you will be encouraged to get outdoors now and in the future and that you take some pleasure in knowing that you are paying your way. Take someone with you, too, so that you can have the full measure of joy outdoors. This entry was posted in Conservation on October 20, 2015 by ronniegarrison.